For “Shaun The Sheep”, 2015 is supposed to bring up more fun loving gems. It’s not just about he is being starred in his own dramatic movie in early 2015 but the 120 life-size statues which have been individually premeditated to get them showcased in the Shaun In The City 2015 Art Trail in majorly in its both inner locations, Bristol and London in United Kingdom. Shaun in the city has been pioneered by following the enormous success of a famous trail “Gromit Unleashed” which remarkably engrossed a substantial 1.8 million visitors and contributed the Bristol Children’s Hospital with the funds of whopping £4.5 million. But this year, people eye on Shaun’s Trail which will be focused on the majestic art and will be seeing the high-flying character crop up at the major locations of London, London and Bristol (home town). These two ewe-nique charity arts trails taking place in the home town Bristol and London will be more specific for the people who love art and sculpture. 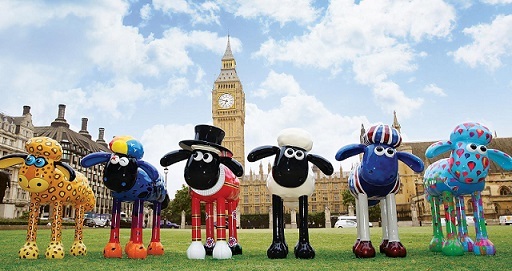 The charity for the Bristol Children’s Hospital will be popping up 120 giant sculptures of Shaun the Sheep which have been especially created by the celebrities, artists and designers, considering the visitors who could enjoy this to iconic locations and green spaces crosswise the cities of London and Bristol. Later in the year, after the exhibition, all the arts and sculptures will be put on auction in a permanent new home to collect funds for the “Bristol Children’s Hospital Charity” and Wallace Children’s Charity which dedicated work for the welfare of poor and sick children in hospitals across UK. If you are someone crazy about realistic sculpture, catch the first flock of 50 out of 120 sculptures which will arrive on 28th March to 31st May in London and the rest flock of 70 sculptures will be available in the pastures of London from 6th July to 31st August. With so many resplendent sculptures emerging in each city, make sure that you manage to catch both.